Brightly colored Australian peacock spiders (Maratus spp.) captivate even the most arachnophobic viewers with their flamboyant courtship displays featuring diverse and intricate body colorations, patterns, and movements – all packed into miniature bodies measuring less than 5 mm in size for many species. However, these displays aren’t just pretty to look at, they also inspire new ways for humans to produce color in technology. One species of peacock spider – the rainbow peacock spider (Maratus robinsoni) – is particularly impressive, because it showcases an intense rainbow iridescent signal in males’ courtship displays to the females. This is the first known instance in nature of males using an entire rainbow of colors to entice females to mate. But how do males make their rainbows? Figuring out the answer was inherently interdisciplinary so Dr. Bor-Kai Hsiung – now a postdoctoral scholar at Scripps Institution of Oceanography at the University of California San Diego – assembled a team that included biologists, physicists and engineers while he was a Ph.D. student at The University of Akron’s (UA) Integrated Bioscience Ph.D. program under the mentorship of Dr. Todd Blackledge and Dr. Matthew Shawkey (now at University of Ghent), and supported by UA’s Biomimicry Research and Innovation Center. The team included researchers from the United States – UA, Scripps Institution of Oceanography, California Institute of Technology (Caltech), and University of Nebraska-Lincoln (UNL) – Belgium (University of Gent), Netherlands (University of Groningen), and Australia to discover how rainbow peacock spiders produce this unique iridescent signal. The team investigated the spider’s photonic structures using techniques that included light and electron microscopy, hyperspectral imaging, imaging scatterometry and optical modeling to generate hypotheses about how the spider’s scale generate such intense rainbows. The team then used cutting edge nano 3D printing to fabricate different prototypes to test and validate their hypotheses. 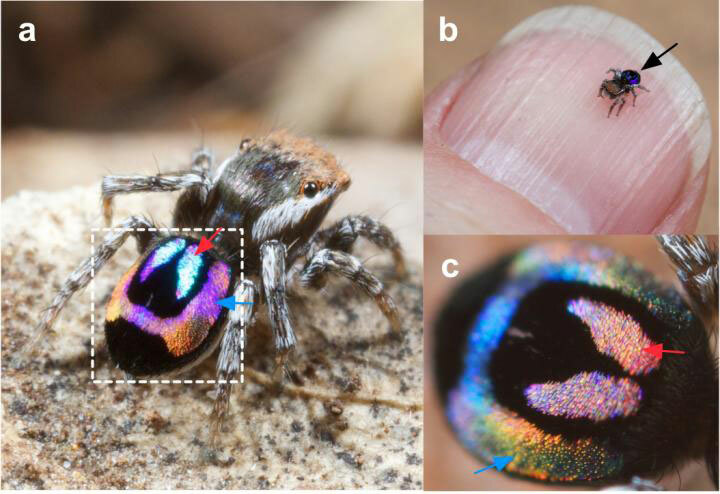 In the end, the team found that the intense rainbow iridescence emerged from specialized abdominal scales on the spiders. These scales combine an airfoil-like microscopic 3D contour with nanoscale diffraction grating structures on the surface. It is the interaction between the surface nano-diffraction grating and the microscopic curvature of the scales that enables separation and isolation of light into its component wavelengths at finer angles and smaller distances than are possible with current engineering technologies. “Who knew that such a small critter would create such an intense iridescence using extremely sophisticated mechanisms that will inspire optical engineers,” said Dr. Dimitri Deheyn with excitement during an interview. Deheyn is the postdoc mentor for Hsiung at Scripps Oceanography and a coauthor of this research. For Hsiung, the finding wasn’t quite so unexpected. “One of the main questions that I wanted to address in my Ph.D. dissertation was ‘how does nature modulate iridescence?’ From a biomimicry perspective, to fully understand and address a question, one has to take extremes from both ends into consideration. Hence, I purposefully chose to study these tiny spiders with intense iridescence after having investigated the non-iridescent blue tarantulas,” said Hsiung. The mechanism behind these tiny rainbows may inspire new color technology, but wouldn’t have been discovered without research combining basic natural history with physics and engineering. “Bringing together such diverse research expertise to understand the incredible diversity of nature and then applying that knowledge to human technology is exactly what UA’s Biomimicry Research and Innovation Center is all about,” said Blackledge. 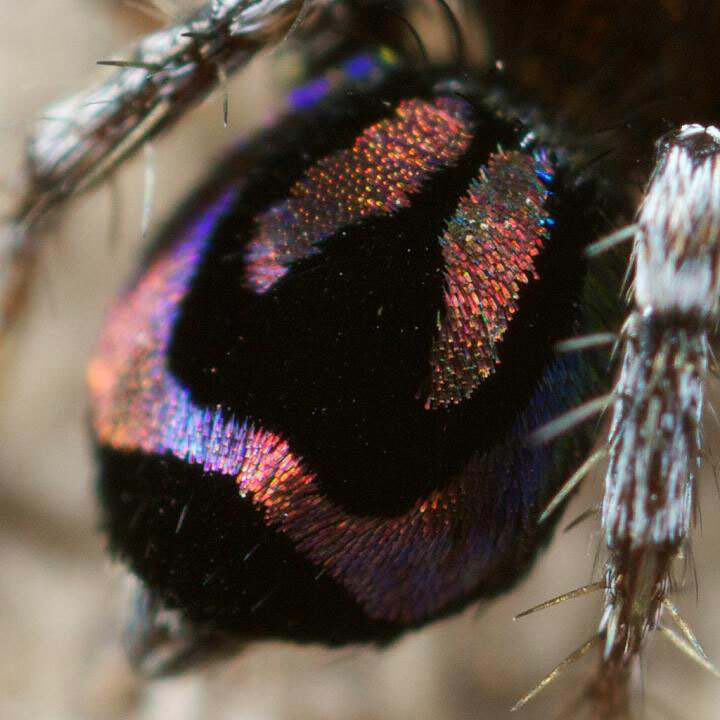 In the end, peacock spiders don’t just produce nature’s smallest rainbows, they could also have implications for a wide array of fields ranging from life sciences and biotechnologies to material sciences and engineering. Be the first to comment on "Peacock Spiders Inspire New Optical Technology"